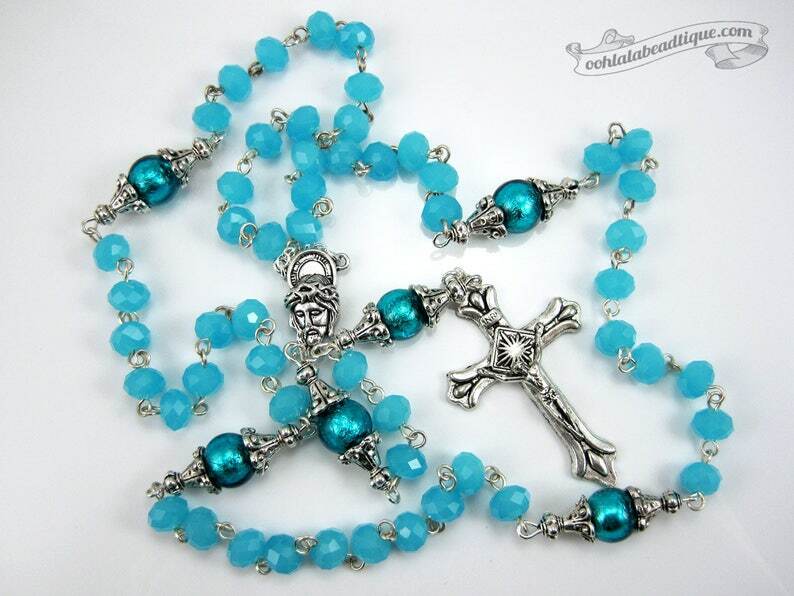 Turquoise Rosary is a wonderful gift for First Communion Day, or Confirmation. This handmade unique Turquoise Rosary necklace is inspired from the traditional Catholic Five decade Rosary Design. "Hail Mary" turquoise jade 6mm rondelle beads are paired with large "Our Father" turquoise blue Murano glass beads with silver foiled inside. The Murano beads are complemented by ornamental Tibet silver, creating a piece that is classic, yet trendy and stylish. Finished off with Jesus Christ silver centerpiece and Fleur-de-lis Crucifix. 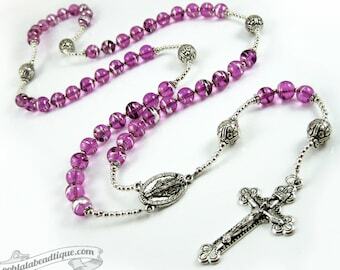 The rosary is hand wire wrapped with silver plated wire for strength, durability and drape. The necklace part of the Turquoise Rosary is approximately 28 inches long. The pendant drop from the centerpiece to the cross bottom is 6.5 inches long. The Fleur-de-lis Crucifix is approximately 2 inches long including the bail. The Fleur-de-lis Crucifix with four ray aureole is a crucifix adorned with lily petals at the arm-ends. For Catholics, the three-pedaled ends represent the Trinity: God the Father, Son and Holy Spirit. Fleur-de-lis INRI Crucifix has a stylized plaque above the head of Christ with four letters INRI. These initials are the Latin abbreviation for “Iesus Nazarenus Rex Iudaeorum”, Jesus the Nazarene, the King of the Jews, a titulus ordered by Pontius Pilate. The four ray aureole around the intersection of the cross depicts the divinity of Jesus, and reminds us of his Resurrection. The shining rays also represent the light of God, enlightenment, truth, and his divine wisdom. Blue color represents the sky, heaven (Exodus 24:10) and Holy Spirit. It can also signify water, the water of the spirit (John 4:13) or the Lord's commandments (Numbers 15:38). Occasionally blue color is used to symbolize heavenly grace. The Virgin Mary is often depicted wearing blue clothing. Blue is the liturgical color of Theotokos, Feasts of the Holy Archangels, and Holy Theophany. Your Turquoise Rosary will be shipped to you in a padded mailing envelope. Package will include "How to Pray the Rosary" Card. 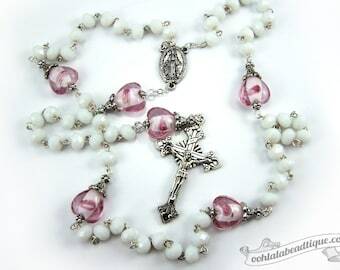 Please have your rosary blessed by your local priest. Many Ooh-la-la Beadtique handmade products are crafted using natural components such as semiprecious stones, freshwater pearls, and wood. No two materials in nature are alike. 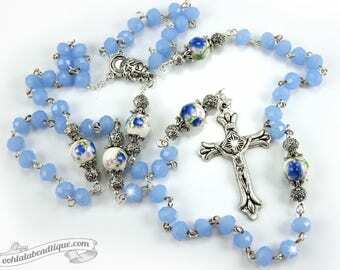 The handmade Turquoise Rosary that you will receive may slightly vary in shade and texture pattern from the picture listing. Also note, that all monitors and computer screens are calibrated differently. The same product may appear in diverse colors on different monitors.